Hey there! I'm so glad you deiced to stop by and visit my little blog. I haven't had much of a sewing/quilting year. Having a baby will kill your quilty life :) Now that my little guy is 9 months old (WOW already?!) I'm finding making time for quilting. Just a snippet here and there. One of the best ways I have found of forcing myself to make something is to make something for someone else. I can't tell you how many UFO I have for myself and my immediate family. Every now and then I take on a new project that is for someone outside of my family. Usually an online swap. This forces me to get something done because there are deadlines and someone on the other line I wouldn't want to disappoint. My all time favorite swap is the DQS (Doll Quilt Swap) hosted on Flickr. A mini quilt is totally doable in tiny quilting sessions. But smaller doesn't always mean easier! I like to try out new techniques, blocks, or patterns on my DQS swap quilts. It's a fun way to try something new without commuting to a giant sized quilt. Plus if you need to scrap the project it doesn't feel like a waste of precious fabric. For my last little quilt I decided to go with paper piecing. I've only done pp maybe four times. So I decided that was enough practice to tackle an advanced block with curved flying geese and sharp little points. SO I decided on a fun NY Beauty block. Ha, ha! It was definitely a learning experience, but in the end I think I did all right. And I decided to add a bunch of quilting to detract from the not so great piecing :) When in doubt add more quilting! Don't forget to visit all the other blogs participating in Blogger's Quilt Festival over at Amy's Creative Side. A very sweet quilt and I love your quilting. Did you do it on a domestic sewing machine? love it! and the piecing looks just fine to me! It turned out beautiful. I love it! Great job. Now *that* is some intense quilting! Great job - love the quilting! 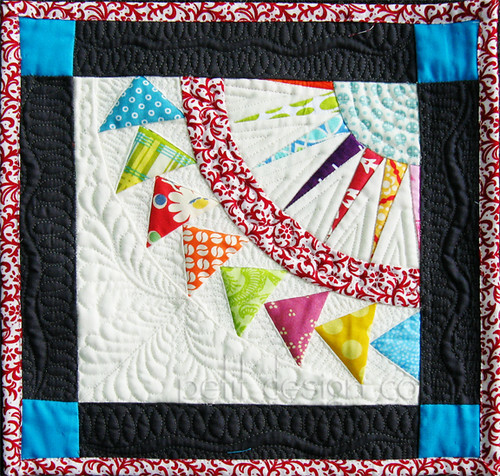 I love this little mini, the colours are so happy and the quilting is excellent! Tanti auguri al tuo piccolino! That is just beautiful! And look at that quilting, amazing. You did great and don't have to hide anything with quilting!! Great little quilt! I love this DQ. I want to try this block one day. The swap is a great way to try new things. I am still waiting on my little mini to arrive from the swap.